With the Swagbucks birthday celebration only a few days away, I figured it was a good time to give you more info about the celebration. Did you read my post about the $1,000 giveaway last week? 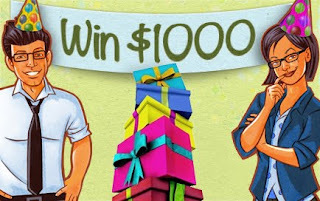 Join the Party and Win $1,000! 1. The Swagbucks Birthday Bash everyone has been RSVPing for is going to be a 24-hr Team Challenge. That means every Swag Buck they earn on that day from Search, Special Offers/Daily Deals, SBTV, Surverys and Tasks will also count toward their party's total. The party with the most SB earned will give out a 10 Swag Buck bonus to each member who contributes; the other party will get a bonus of 5 Swag Bucks each. They are also awarding the top earner from each party with a bonus of 100 Swag Bucks and the title of Party Animal! By now, if you're attending one of the parties you've noticed the giant pink and green puzzle. Behind that puzzle is the picture of your party. On the 27th, they will reveal one piece for you, but to reveal the rest, your party has to collectively hit a series of earning goals, one for each category. When you hit the goal, a piece of the picture is revealed! There will be meters to help you track your team's progress. If you reveal the whole picture before midnight, ALL PARTY BONUSES ARE DOUBLED! 2. Swagbucks is having an all-day Swag Code extravaganza on Monday - 130 Swag Bucks in codes will be given out over the course of 24 hours, meaning everyone from night owls to early risers will be able to get Swag Codes! So, are you coming to the party? ?